With the PinPoint-FC 293T Platform Kit for Targeted Gene Insertion you get the PinPoint 293T Cell Line and all the plasmids you need for implementing the next steps of the PinPoint Targeted Integration process. Efficiently generate isogenic cell lines based on 293T cells using a process that is easily converted into a high-throughput assay. And with the PinPoint System, you can achieve high-efficiency integration of any-sized insert. Engineering cells with the PinPoint-FC 293T Platform Cell Line for Targeted Gene Insertion simplifies a two-step process into a single step. You can skip the placement of the PinPoint attP site and associated validation to verify copy number, and move straight to the insertion of your expression cassette with the PinPoint Donor Vector and PinPoint Integrase. The PinPoint Integrase mediates a recombination event between the PinPoint attB site (located on the PinPoint Vector) and the PinPoint attP site. Because the PinPoint Integrase only recognizes the pre-placed PinPoint attP site, you get very stringent control of integration location. Figure 1. Efficient placement of the PinPoint attP site using the PhiC31 System. 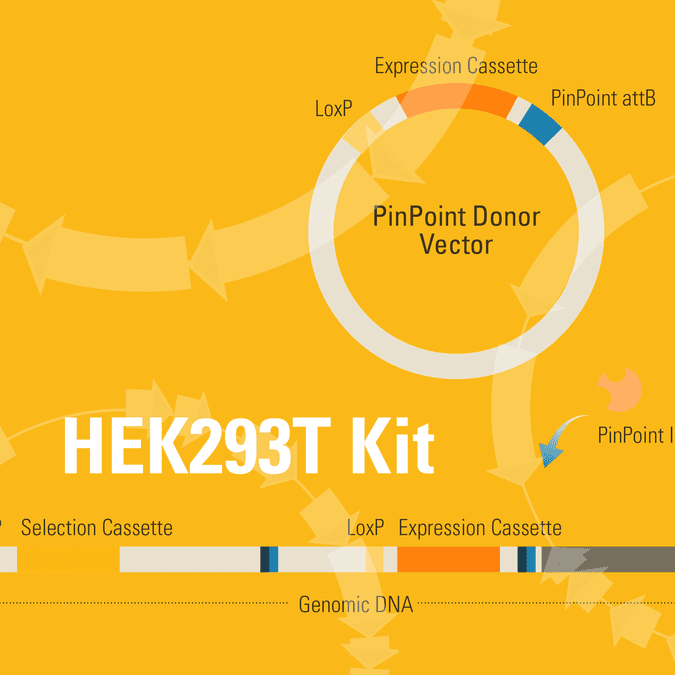 Step 1 of the PinPoint Targeted Integration System—the PinPoint attP site was placed into HEK293 cells using the PinPoint-FC Placement Vector (Cat.# PIN300A-1) and the PhiC31 Integrase (Cat.# FC200PA-1). Positive cells were selected with G418 (neomycin resistance) for fourteen days and six separate lines were picked and expanded. After eleven days, the cells were fixed and stained with a solution of 50% methanol plus 1% methylene blue. The plates were washed twice with PBS and allowed to air dry. Only the plate of cells that were transfected with the PhiC31 Integrase Expression Plasmid showed a robust number of cells. Figure 2. Targeted integration with the PinPoint Integrase and a PinPoint Donor Plasmid. Step 2 of the PinPoint Targeted Integration System—the cell lines created in Figure 1 were transfected with a Positive Control PinPoint Gene Donor Vector expressing GFP (Cat.# PIN600A-1) for precise integration. Unlike the R4 integrase used in a similar system, the PinPoint Integrase does not recognize pseudo-sites and will only integrate at its placed recognition sequence. This feature results in the increased efficiency of correctly retargeted cell lines compared to the R4 integrase system. The entire therapeutic gene expression cassette is active and fully insulated with cHS4 DNA elements. Figure 3. The PinPoint Integrase mediated specific placement of the PinPoint Donor Vector. We used a junction PCR assay to verify that the PinPoint Donor Vector was integrated at the correct site targeted to the correct site, amplifying across the PinPoint attL site (after PinPoint mediated integration, the plasmid-borne PinPoint attP and attB sites become genomic attL and attR sites). The appearance of bands in the L1, L2, and L3 lanes only indicate the predicted, PinPoint Integrase-mediated insertion of the PIN600A-1 Donor Vector at the placed PinPoint attP site with high precision.